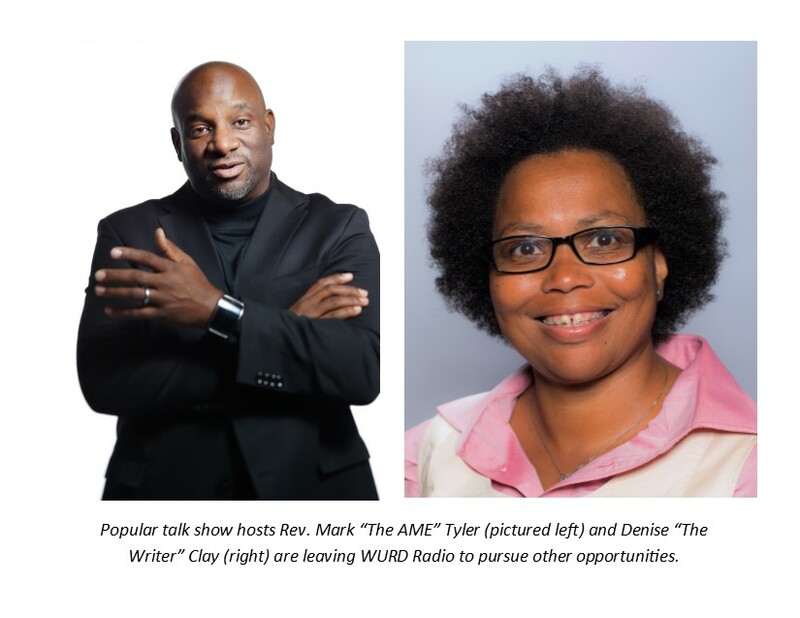 PHILADELPHIA – Dec. 30, 2017 – PRLog — Mark “The AME” Tyler and Denise “The Writer” Clay leave WURD Radio. Their official statements are below. If you have any questions or require additional information, please contact TylerMadePR at tylermadepr@gmail.com or call (609) 247-2632. It is with mixed emotions that I have decided to leave WURD Radio as host of “Wake Up with WURD”. I started at WURD almost three years ago as a volunteer host of a new show, Urban Insight. What began as a one-hour program, quickly grew to a two-hour show and attracted a dedicated following each Friday evening. Over the past 3 years, I have had the pleasure of getting to know tremendous colleagues and producers, interviewing amazing guests, and “working with” the best listening audience any host can find. Philly, I love you! I would like to especially thank POWER (Philadelphians Organized to Witness, Empower, and Rebuild) for their significant sponsorship of the show. Those of you who are regular listeners to WURD’s “Wake Up With WURD” know that being a writer is a big part of my identity. So please understand me when I tell you that what follows this sentence is one of the toughest things I’ve ever had to write. Friday was the last day for myself and my co-host Mark Kelly Tyler on “Wake Up With WURD”. I’d like to thank the Lomax Family for the opportunity to come back to my first love, radio, and inform the community in a way that assumes it’s intelligence and values it’s input. When Mark asked me to join him on “Wake Up”, it was a chance wfv to continue the work I was doing with him on his show, “Urban Insight.” It was great talking about the issues of the day, and interacting with WURD listeners, many of whom have taken me into their hearts. I’m eternally grateful for that and always will be. While you won’t be hearing me on the radio from 7-10 anymore, please know that I will still value your voices on my other platforms: The Philadelphia Sunday Sun, Philadelphia Magazine and the Philadelphia Public Record. Being on “Wake Up” gave me the chance to interact with listeners (and Facebook live viewers) around the world as well as the city’s activist community. I’d especially like to thank POWER (Philadelphians Organized to Witness, Empower, and Rebuild) for their support of what we were trying to do. Again, I thank you for showing Mark and myself the love that we’ve gotten from all of you over the last three months. I appreciate it immensely. Hopefully, we’ll be together on the airwaves again soon. Radio is my first love, and I’ve always believed that it’s the best place to tell the stories of People of Color and other marginalized communities. …and the coffee. Especially, the coffee.